With a market dominated by high house prices and increasing loan-to-income mortgages, access to equity is key. Unfortunately access to equity is constrained by income and financial wealth inequality and has become increasingly so in this low interest rate environment. The ability of lower income households to raise a deposit is constrained by their ability to save. High housing costs and high inflation have put pressure on incomes and left many households struggling to meet their day-to-day needs – let alone put aside a substantial amount of savings (which will generally see a negative real return in a typical bank account). 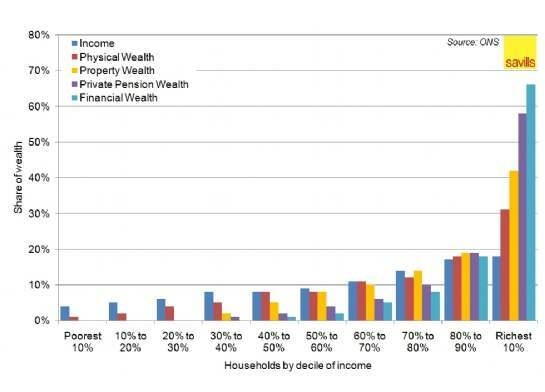 Meanwhile those higher up the income distribution, many of whom will already be owner occupiers and have access to equity, are better able to save an element of their income and invest it (in say the property market) and achieve positive real income returns. This in turn widens income inequality and further widens the gap between those that have equity and those that don’t, leaving those that don’t struggling to find stability in a rental market designed to be a temporary stepping off point on the route towards owner occupation. Figures compiled by Savills, using data from the online property website Globrix, show that the gap between traditional property hot spots and the rest of the country is growing. The average price per square foot in England and Wales may be £220, but in the Royal Borough of Kensington and Chelsea, it is £1,396 — 10 times that in Ipswich, Suffolk.